Mars Atmosphere and Volatile Evolution or the MAVEN mission discovered some incredible new pieces of information about Mars. These findings revealed that the Sun, in its devilish way, destroyed the atmosphere of Mars. Stripping away a heavenly environment where water flowed and life could thrive in. Furthermore, NASA learned that the once-thick atmosphere of Mars was blown away by the Sun’s solar winds between 4.2 billion and 3.7 billion years ago. What’s terrifying is that Mars only retained 1% of its atmosphere as a result. Not only that but the rate at which Mars was losing its atmosphere: one quarter pound of atoms per second! That is the mass of a cheeseburger being stripped away by the solar winds every second. A tasty but frightening image. What about our very own Earth? Don’t we get hit by solar winds too? Well our Earth is shielded by such harmful solar winds thanks to the magnetic field or dynamo effect. We see these shields being actively used in one of the most gorgeous looking natural events, an aurora. However, the magnetic field of Mars was shut down billions of years ago. Not only was this incredibly troublesome for Mars to lose its atmosphere but the time it lost is what really made it incredibly vulnerable. In the early solar system the Sun was essentially a newborn expelling its energy in large plasma clumps. Today the Sun’s solar wind can travel from a gentle 10 km/s to a very intense 800 km/s. In the early universe the speeds were at least twice as fast with much bigger clumps of plasma or charged solar particles. 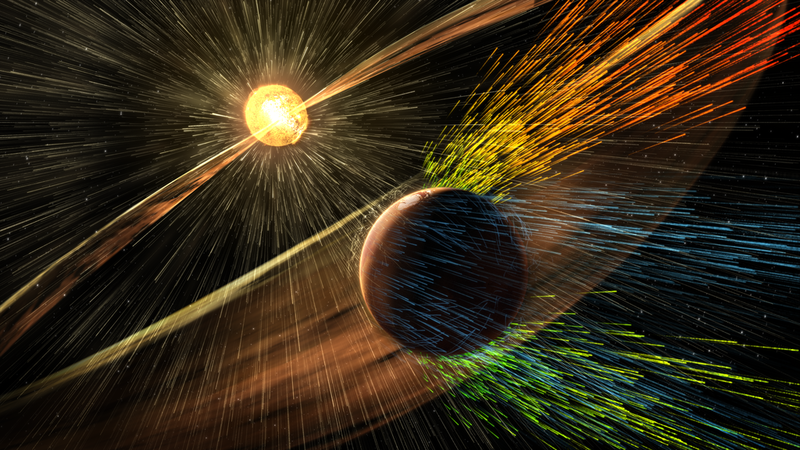 Here you can see in much greater detail of how these solar winds are stripping away the atmosphere of Mars. If Earth lost its magnetic field back then we would not be sitting here today. NASA scientists also looked at how these solar winds would look from the surface. On Earth we experience northern lights for perhaps a humble few hours. 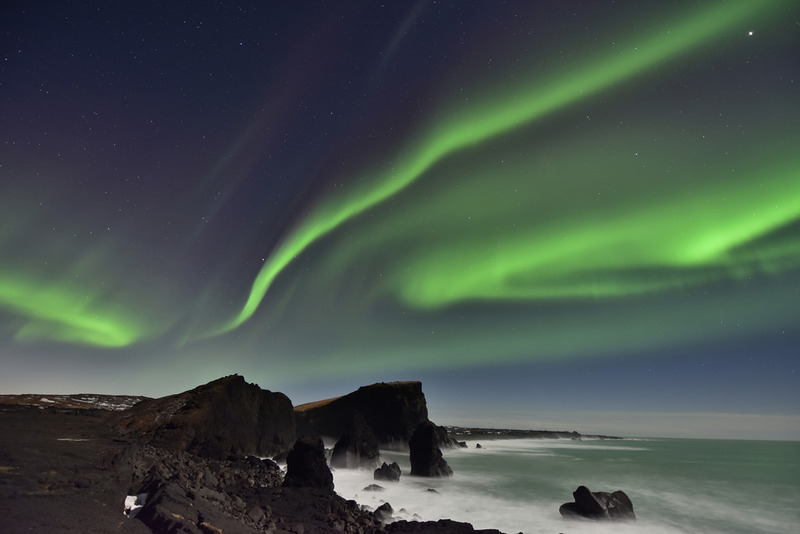 Whereas a Martian Northern lights can last for 5 days covering the Northern hemisphere! Now let’s move on to asking some questions now that we have this new Martian evidence. Will the atmosphere on Mars ever return? Unfortunately the answer is a no. The process cannot be reversed. In science fiction there is the idea of terraforming a planet to jump start life and a habitable environment again through releasing gasses trapped in the surface. However, the gas is not there as it was stripped away into space. Could this happen to Earth? In a universe full of possibilities this could actually happen to Earth. However, don’t panic (find your towel) because the main driver that really affected Mars was the time it happened. Since we live in a state where the charged particles are not as threatening, Earth would not succumb to the same fate as Mars. The findings from MAVEN as well as the rovers on Mars indicate that the water may have been shed during the process of which the Martian atmosphere escaped. Huge news and findings from NASA's MAVEN spacecraft. Find out how Mars really lost its atmosphere.